Matlock Town Under-18s defender Alex Phillipson says that playing for the club has helped him to “see how football can change,” after enduring a period of upheaval in his development, writes Thomas Shaw. The 17-year-old, who joined the Gladiators earlier this year, had spent seven years on the books at Chesterfield before taking a brief hiatus from the game, and he believes that he’s now found what he felt was previously missing for him. In an interview with students from the University of Derby, Phillipson said: “I feel like I’ve taken one step back but two steps forward since I’ve joined Matlock,” although he initially turned a blind eye to interest from the club. “I didn’t think it was the right thing for me then,” he said. “They always wanted me, however, I thought I’d take the opportunity”. The centre-back’s current attitude is a revelation when compared to the mindset that caused the disappointing end to his Chesterfield days. Phillipson was one of four youth team players, along with Ashton Hall, Nathan Clarke and Ethan Knowles, who were called up to the first team for their 1-0 defeat to Basford United in the Integro Cup on Monday night. 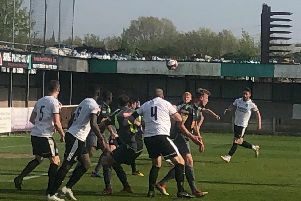 Although failing to feature from the substitutes’ bench, Phillipson is enjoying his experience with the Northern Premier League side.